Place a small towel on the floor. Using involved foot, curl towel toward you, using only your toes. Relax. Sit with involved leg crossed over uninvolved leg. Grasp toes with one hand and bend the toes and ankle upwards as far as possible to stretch the arch and calf muscle. With the other hand, perform deep massage along the arch of your foot. Hold 10 seconds. Repeat for 2-3 minutes. Repeat 2-4 sessions per day. Stand placing hands on wall for support. Place your feet pointing straight ahead, with the involved foot in back of the other. The back leg should have a straight knee and front leg a bent knee. Shift forward, keeping back leg heel on the ground, so that you feel a stretch in the calf muscle of the back leg. Hold 45 seconds, 2-3 times. Repeat 4-6 times per day. 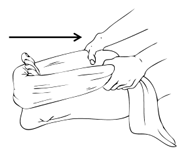 The towel stretch is effective at reducing morning pain if done before getting out of bed. Sit with involved leg straight out in front of you. Place a towel around your foot and gently pull toward you, feeling a stretch in your calf muscle. Stand with uninvolved foot flat on a step. Place involved ball of foot on the edge of the step. Gently let heel lower on involved leg to feel a stretch in your calf. With involved foot resting on a frozen can or water bottle, golf ball, or tennis ball, roll your foot back and forth over the object. Repeat for 3-5 minutes, 2 times per day.